One of the things that make us the best Vancouver wedding photographers is our use of light, location, posing, composition and placement of the bride and groom in order to tell a story in a way another isn't going to. 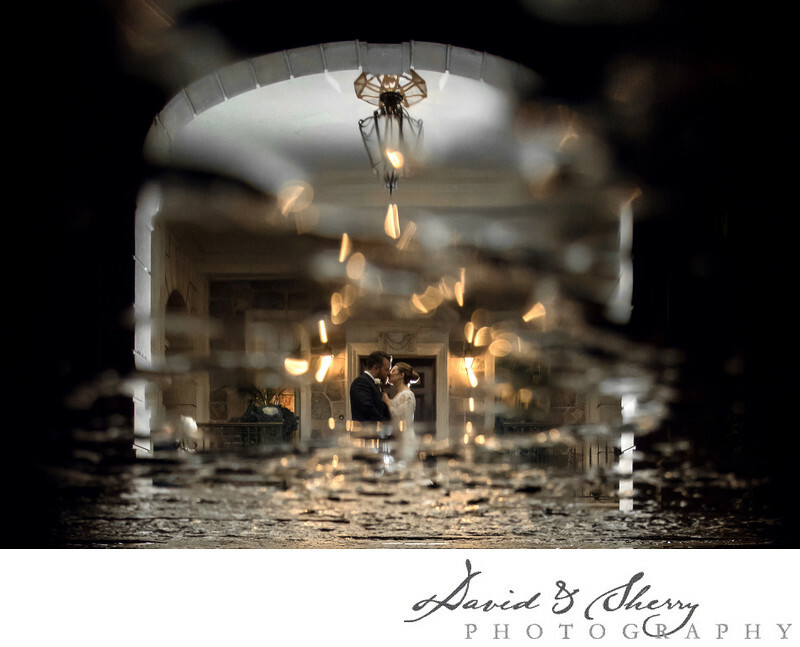 In this beautiful reflection of the newly married couple I shot upside down at the cobblestone walkway and placed an off camera flash behind them to give a rim light to their faces and to light up the foyer that was in front of us. Our use of a wide angle lens allowed us to capture what looks to be a texture overtop of the image, but in reality it is a real life texture and the image is the reflection in the water. Seeing something like this tells us that no matter the weather on your day you can get amazing photos. Without the rain, there would have been no reflection to shoot through. We are always looking for this type of creativity in order to allow our work to stand out against the rest that is available in the Vancouver area. We will go to great lengths to capture unique and stunning photos that you too will think are the best in Vancouver.